Cheap ping pong tables are hard to find. But once you find them they can be really enjoyable for two reasons. One is that you got them for a low price and two is you don’t have any buyers regret, so you enjoy playing even more. Today, I am going to share with you two of the lowest price ping pong tables you can find on the market. The price for these tables is about $170-$200. Comparatively, your quality ping pong table will cost you from $500 to $5000. You can spend the money on organizing ping pong parties and buying other ping pong equipment such as best ping pong paddles or even best ping pong robots. For about $160 you can get this table: MD Sports Table Tennis Set, Regulation Ping Pong Table with Net, Paddles, and Balls (8 Pieces). This ping pong table is for sale right now on Amazon. I mean this price is cheaper than getting a used ping pong table. The best part about this table is that it is regulation size. 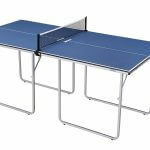 You can find this table if you search for ping pong table Amazon on www.google.com. 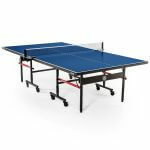 For about $190, you can get this table: JOOLA Midsize Table Tennis Table. This table is for sale on Amazon and it has over 1000 4.5 star reviews on Amazon. The best part of this table is that it is a quality table. Above I mentioned two cheap ping pong tables: The first one – The MD Sports Table – is a regulation sized table and is the lowest cost. However, in terms of quality and ratings on Amazon, Joola Midsize Table Tennis Table is the clear winner. Below I review both of these tables. This table has over 1000 4.5 star reviews on Amazon and costs only about $190. That’s an incredible value. I think the best part about this table is that its compact. It can easily be separated into two halves, which can be easily be stored, can be used at parties to hold food or you can use it to play board games. Here is a picture of the table with dimensions. A key negative for this table is that it’s not weatherproof. You can play with it outdoors but I wouldn’t leave it out there to be exposed to the sun and/or rain. We have ours in the house and take out onto our covered porch but we don’t leave it out there. It’s easy to move around. 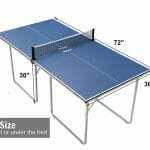 In summary, the JOOLA Midsize Table Tennis Table is perfect for anyone who likes to play ping pong but it doesn’t have enough space for the table. The table stands at a standard height (30 inches or 2 feet + six inches) with a surface that is 66% of ( or 72 inches) the length of a regulation-sized table. Each half of the table is uniform and can stand on its own. That’s separation is great for playing board games. The foldable halves can also be stored in most regular sized closets. The JOOLA Midsize Table requires no assembly. Simply join the two halves, place on the net and you’re ready to play! Start playing like a pro with this table built for die-hard fans! JOOLA is a proud sponsor of the US Olympics team. Next, we cover the MD table, which is the lower price but has slightly lower ratings as well. I still think I would pick these two tables overused ping-pong tables. If you are a serious player but don’t have enough loot to spend on this, I highly recommend this table. Unlike the earlier table, this is a regulation size table, so you can practice on it without any concerns. It is also a foldable table and very easy to assemble. Here are the features of this second cheap ping pong table. 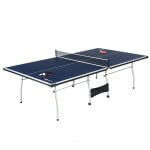 8 PIECE unit includes regulation size table; removable net; 2 posts; 2 paddles; and 2 ping pong balls. This space-saving ping pong table lets you enjoy playing in your game room area. RESILIENT 15mm tabletop provides great ball bounce. Added support and stability come from a 1 1/8” apron around the table. Overall size: 108”L x 60”W x 30”H. Weighs approx. 121.5 lbs. Plug and Play with this complete Ping Pong Table Set. Unfold and set up the table, set up the net and grab the paddles. This fast-paced game enhances hand/eye coordination, reaction time and stamina. It’s FOLDABLE, which allows one to practice against the folded half by oneself. and space-saving storage solution. This game table is the perfect for a bad weather day when distraction or indoor activities are a must. Fun for kids and adults of all ages. It comes with a 30 DAY MONEY BACK GUARANTEE ensures your satisfaction. If you’re not delighted with the fun and function of the MD Sports Ping Pong Set, return it for a full refund. Just for reference, the biggest complaint about this MD ping pong table is that it is somewhat difficult to assemble. I think for the price and the fact that it is a regulation size table, it might be worth the hustle. You can’t get a regulation size table for this price. In summary, if you want a quality table for fun I would get the Joola Mid-size table, you can’t beat the less than $200 price. 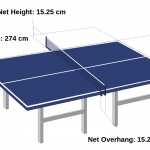 If you’re a serious ping-pong player and would like to save some money, I would get the MD Ping pong table, which is regulation size. I hope you like this review of cheap ping pong tables.